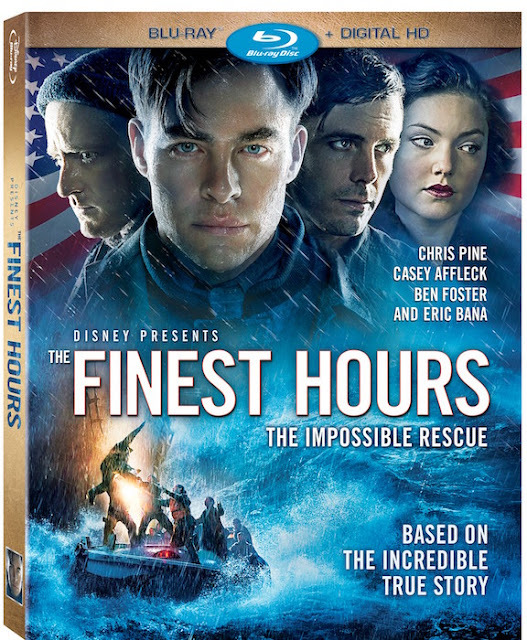 The Finest Hours is a heroic action-thriller based on the extraordinary true story of a 1952 U.S. Coast Guard small-boat rescue. This Disney movie based on the non-fiction book The Finest Hours by Casey Sherman and Michael J. Tougias starring Chris Pine, Casey Affleck, Ben Foster, and Eric Bana storms home on Blu-ray™ Combo Pack, Digital HD and Disney Movies Anywhere May 24th. This heroic action-thriller is based on the extraordinary true story of the greatest small-boat rescue in Coast Guard history. In 1952, a massive winter storm strikes off the coast of Cape Cod, ripping a T-2 oil tanker in half and trapping more than 30 sailors inside its rapidly sinking stern. When word of the disaster reaches the U.S. Coast Guard, four men led by Captain Bernie Webber set out in a 12-seat boat on a daring mission to rescue the stranded men, braving freezing cold, 60-foot waves and hurricane-force winds, and guided by Webber's vow that "We all live, or we all die." An all-new documentary "Against All Odds: The Bernie Webber Story," in which real-life residents of Chatham recall the events that set the stage for the film's historic rescue mission. BROTHERHOOD – Cast members reflect on the bonds they forged during the shoot. TWO CREWS – Chris Pine and Casey Affleck share insights into Bernie Webber and Ray Sybert, men who led their respective crews against all odds. WHAT IS YOUR FINEST HOUR? – A Coast Guard member recounts an incredible rescue. THE FINEST INSPIRATION: THE U.S. COAST GUARD Meet the people who put their lives on the line for others. and The Story of How They Met. If you are in USA or Canada and would like to win a copy of The Finest Hours enter the giveaway through the rafflecopter below. This giveaway ends on June 15th. Please leave comments and follow my social media networks to be eligible to win. I live in Detroit. I saw this movie in theaters, I would love to own it! I'm from Ontario. I'd like to watch this movie because I love both thrillers and true stories. I live in the USA and the previews looked really good. I live in newfoundland and would like to win this for my husband to watch. I would not mind watching this. I am a big movie buff. I live in NY and I want to watch because I am a big movie buff! I live in Nova Scotia and it sounds like a movie I would like to watch. I live in Nova Scotia. I would love to watch this movie because I love based on true story movies. I live in Toronto Canada and this looks like a great adventure tale. Looks like a fantastic movie. I live in Utah, USA and think this movie looks amazing! Where in Canada or USA do you live? Why do you want to watch this movie? because it looks like a movie i would enjoy. I like movies that are based on True Stories. We live in Ontario Canada and I have heard wonderful things about this movie. I live in Toronto, CAN, and I want to win as I like Chris Pine! i live in Oh would be cool to win this. I live in NS and I think it would be a great family movie. From Ontario and would love to see this movie! This movie looks like it would be awesome.